You are here: Home / Auctioneers / Do your guests care whether you’ve hired a professional benefit auctioneer? After one of my weekend auctions, my team and I fielded a number of compliments about our professionalism. It reminded me of a story. Back in 2005, I worked with a national client who held a fundraiser in Washington, D.C. They had three items to sell in a live auction. Although they often held live auctions, it was the first time they’d hired a professional benefit auctioneer to oversee it. The timing was bad for me as I was flying back from some work in Germany. With weather and travel being so unpredictable, I was concerned I’d miss the live auction. To play it safe, I sent one of my lead auctioneers to work the event and told him I’d meet him there. When the plane landed, I scooted to the hotel. The crowd was small — maybe 100 people. After he sold the items, he walked to the back of the room where I stood and we listened to the final few programmatic remarks before the gala ended. Even with only 100 guests and 3 live auction items, it makes a difference. Your guests crave professionalism. They feel better about donating to you when your gala feels polished. This doesn’t mean your auction needs to be top-of-the-line in every aspect, but it needs to show that you are making smart decisions about investing in your auction. Your guests notice the difference. jencyphers Denver hospice mask project gala was a great event. Next time hope there’s social marketing, professional auctioneer, & better venue – ?! Did you see that? She posted it! She wants a professional auctioneer. Would you be more inclined to pay $200 for a meal when the chef is a James Beard award-winner, or when the chef is your Aunt Martha? One is a professional; Auntie isn’t. Are you more inclined to buy a $5,000 ring from a salesman at Tiffany’s, or the guy hawking jewelry on the sidewalk? The first guy is a professional jeweler. The second guy isn’t. Are you prepared to pay $80 for concert tickets to your favorite musical act? Would you also pay $80 to hear the 4th grade orchestra from your local elementary school? One is a professional. My guess is that most guests tell the auctioneer how much they appreciated him/her, but fail to make that same comment to the organizers. I know that if guests were as vocal with organizers as they are with my team and I, there could be no doubt. 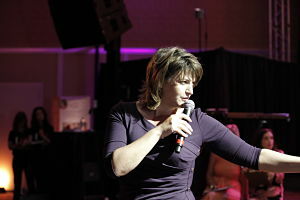 The professional benefit auctioneer represents your nonprofit on the mic; don’t leave that task to amateurs.